Organized with the Urban Institute. 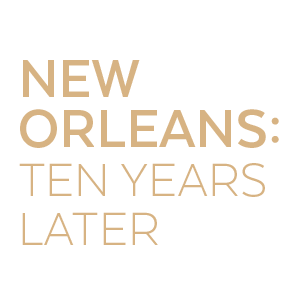 9:05 a.m. Town Hall: What Does it Mean to Know New Orleans? 2:05 p.m. Katrina and Sandy: What Kind of Cities Do We Want to Build? 4:00 p.m. Town Hall: What Does New Orleans Now Know? Michael Hecht, President and CEO, Greater New Orleans Inc.
Are Streetcars Parts of the Transit Network? Are they primarily about economic development or getting people around a city? How Louisiana became the third most productive state in the film industry. The mayor on why his city is now a magnet for traditional businesses and startups alike. A new study shows that vouchers for low-income families in post-Katrina New Orleans haven’t helped integrate or improve neighborhoods. A New Orleans art project aims to comment on deadly weapons from America’s streets–and to transform how they’re seen by young men at risk of violence.